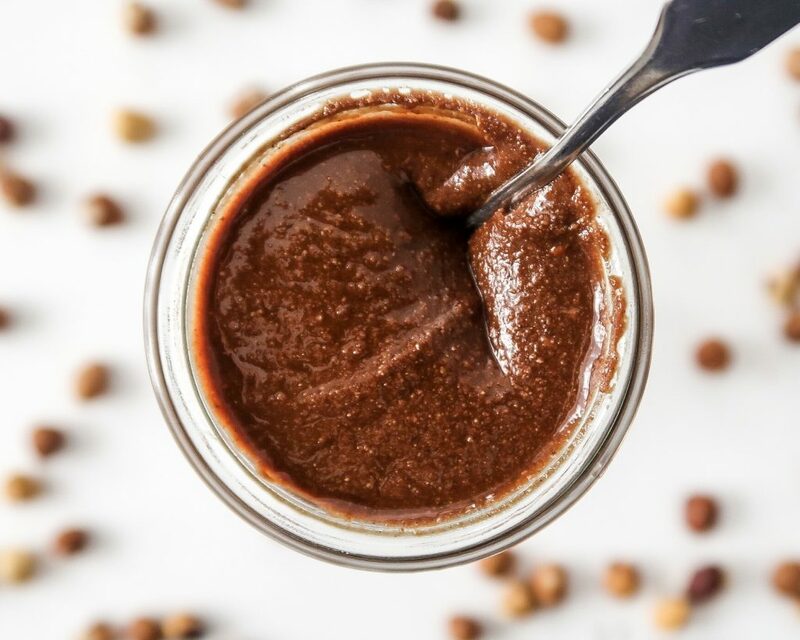 Making your own nut butter at home opens up the possibilities to so many delicious flavor combinations. 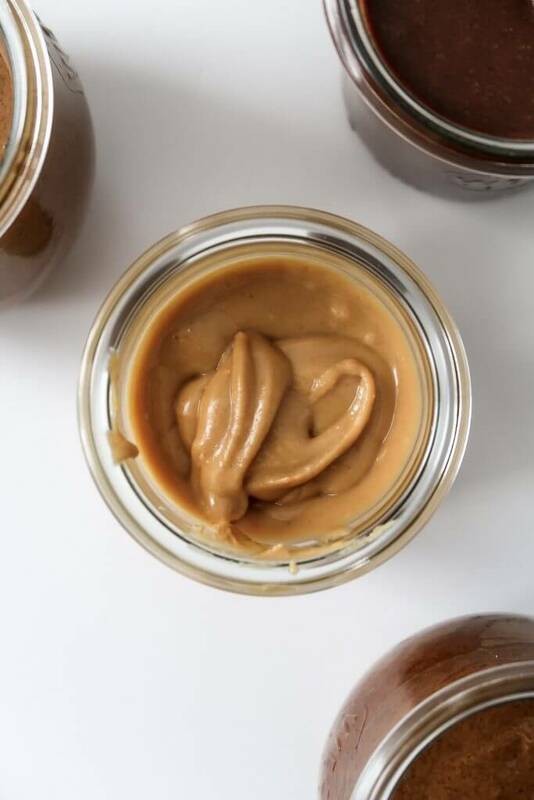 In this blog post, I am showing you how to make nut butter at home and share with you 4 simple and delicious recipes to try. 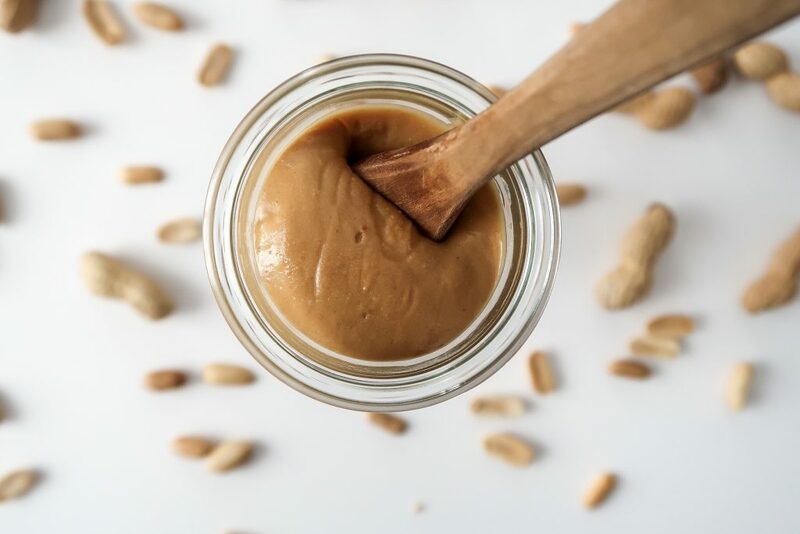 Ever since I went vegan, nut butters are a staple in my diet. If I had to choose one thing to live off, it'd probably be peanut butter! 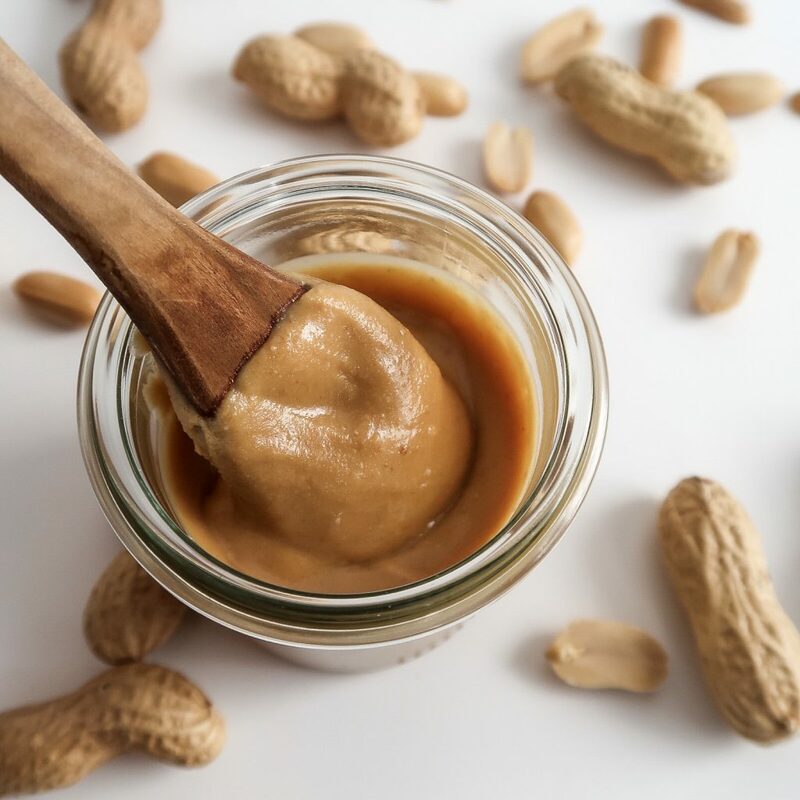 natural ingredients: Most of the nut butters you can find in the supermarket (especially the budget options) have a lot more than just nuts in them. 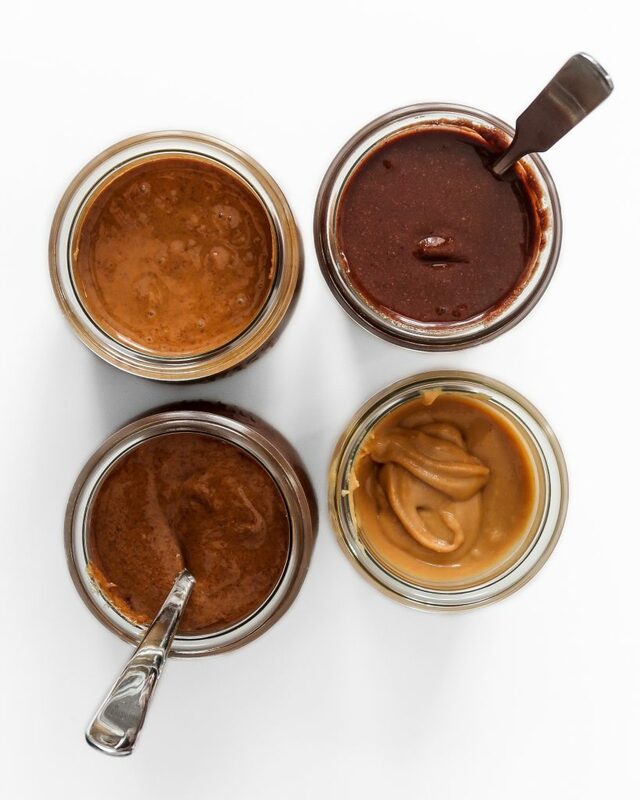 Sweeteners and emulsifiers are added to make the nut butters tastier, creamier and more homogeneous. 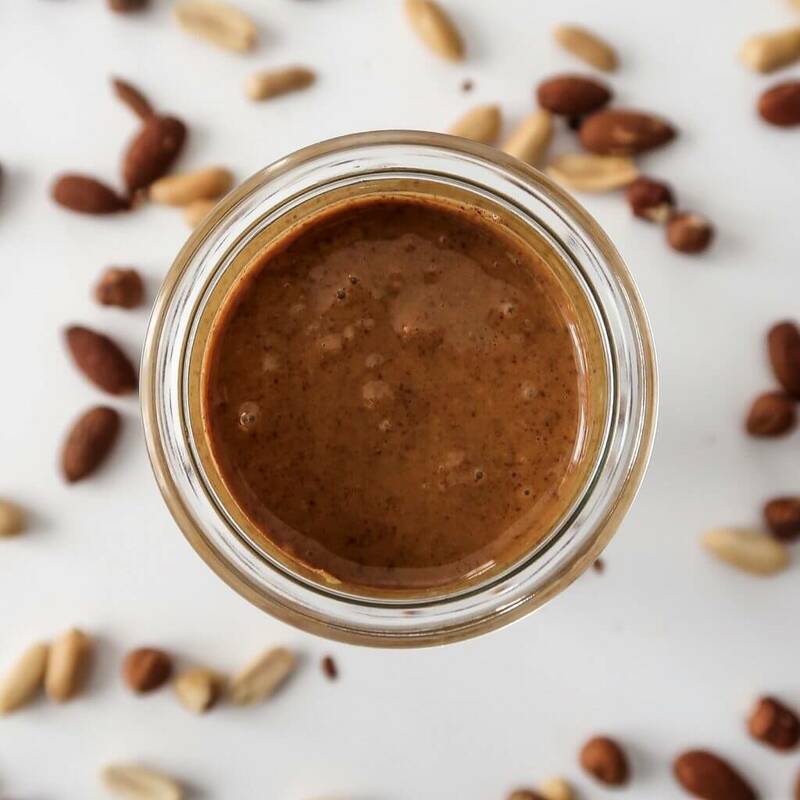 But you really don’t need much more than nuts and a few spices to make delicious, smooth nut butter. 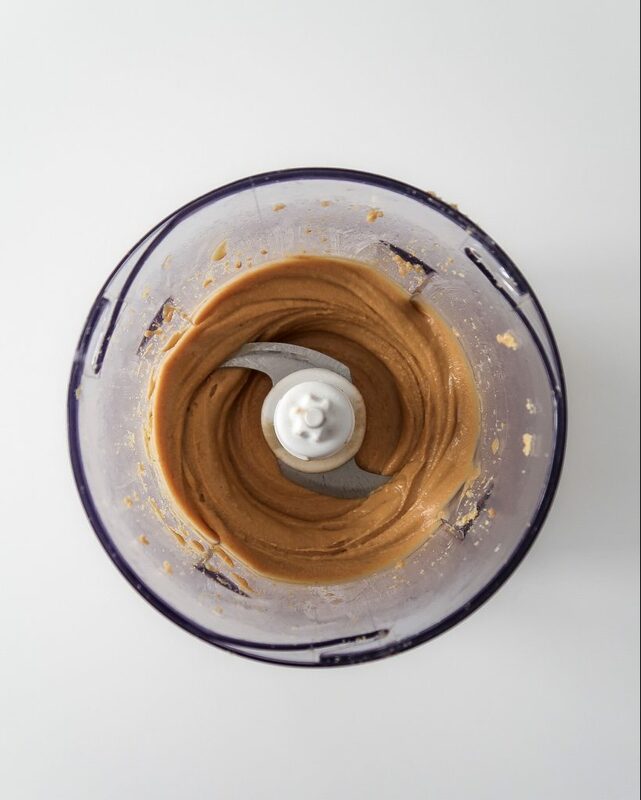 What I love about making my own nut butter is that I get to choose the ingredients and know exactly what’s in it. 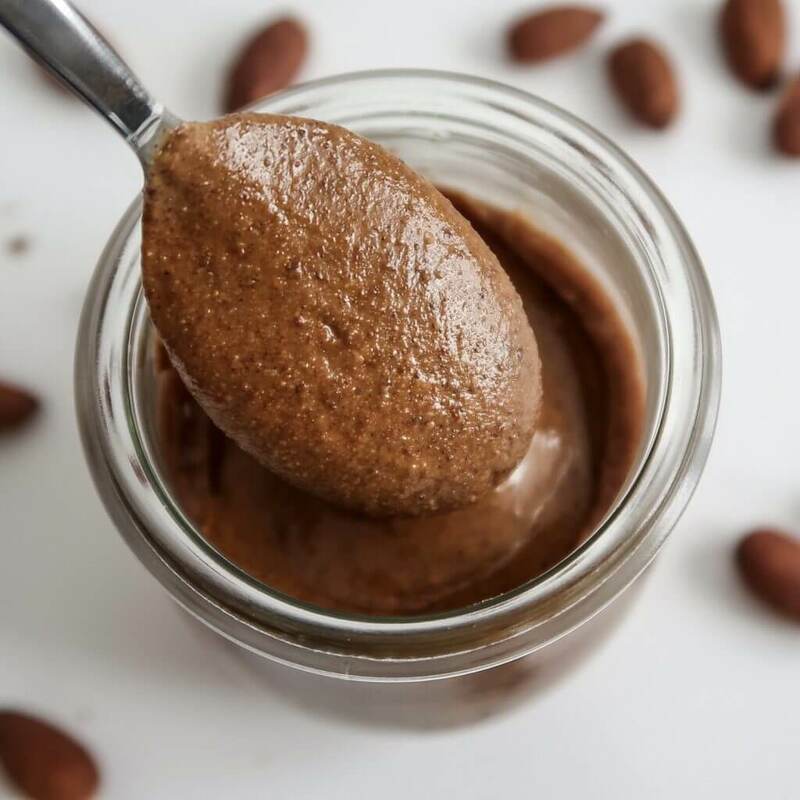 cheaper: With the amount of nut butter I am consuming, I’d probably be broke by now if I kept buying them from the store… At my local supermarket, a jar of almond butter costs me 3,60€/100g whereas whole almonds cost 0,90€/100g. 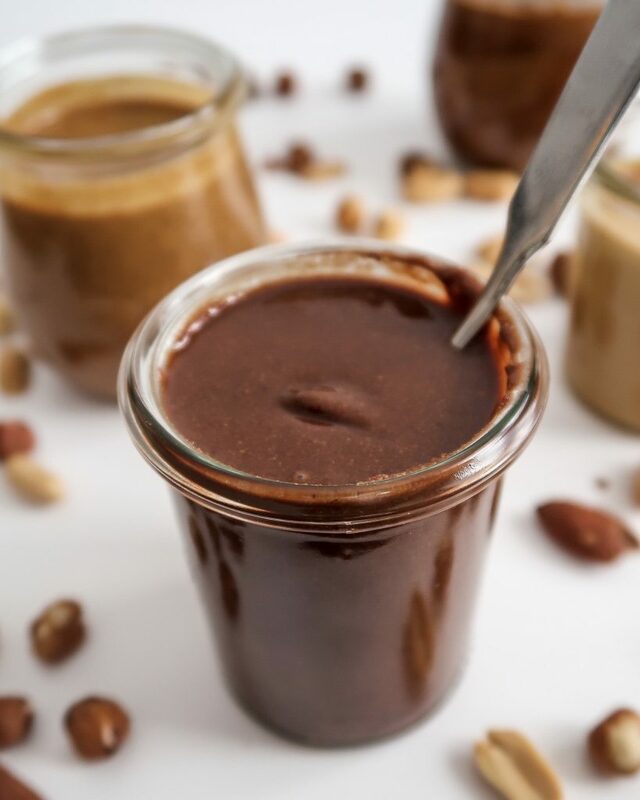 Making your own nut butter is a great budget-friendly alternative. 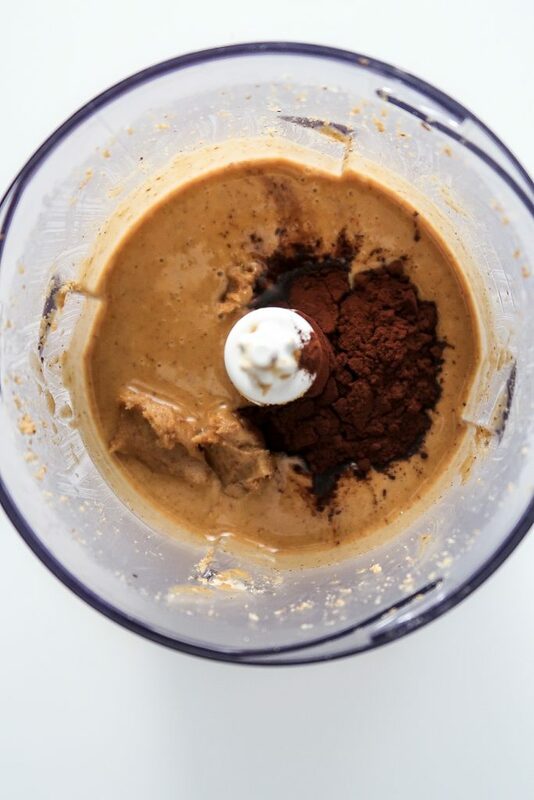 awesome flavor combinations: In most supermarkets, you’ll find peanut butter, tahini (sesame seed butter) and – if you’re lucky – almond butter. 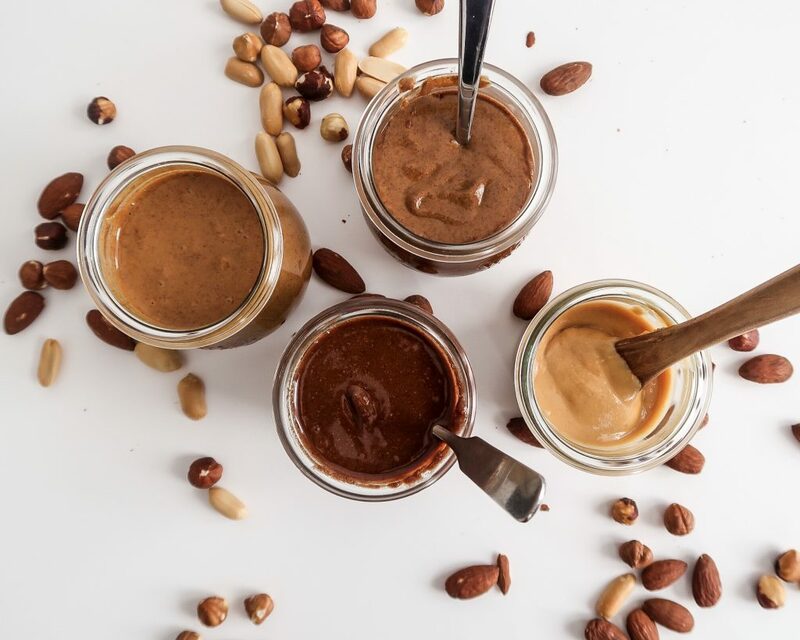 But there are sooooo many nut butter combinations to make – adding different spices or using a combo of different nuts and seeds and even dried fruit. 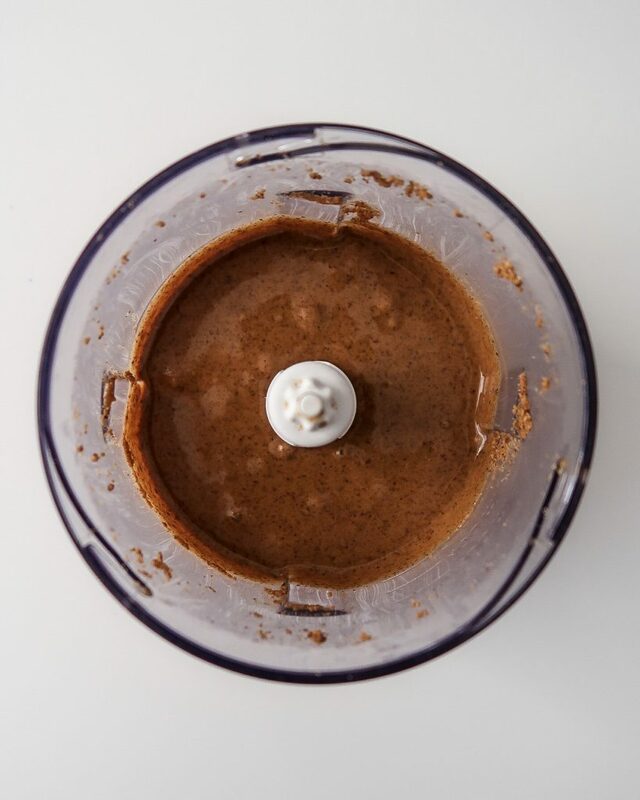 When you make your own nut butter, you can add whatever you like and really get creative. 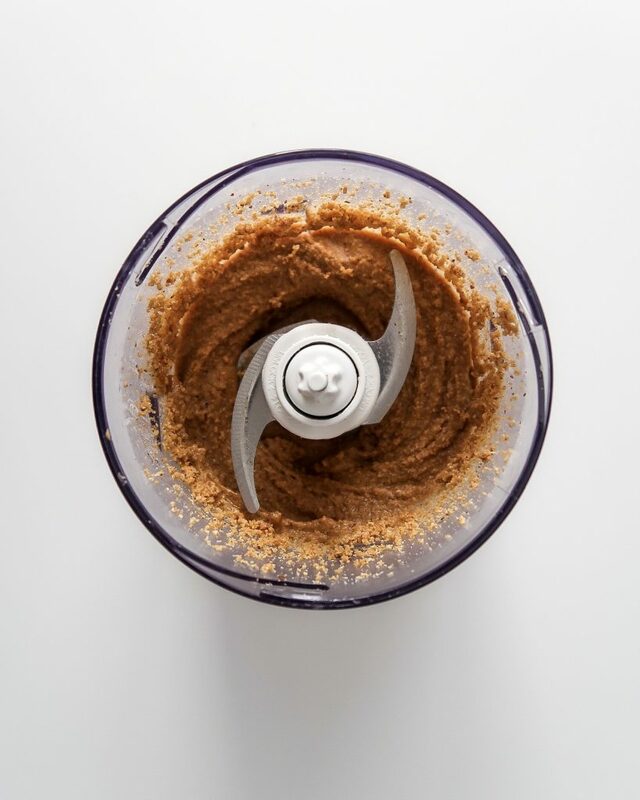 All you need to make your own nut butter is a high-speed blender or food processor - and your favorite type of nuts of course. 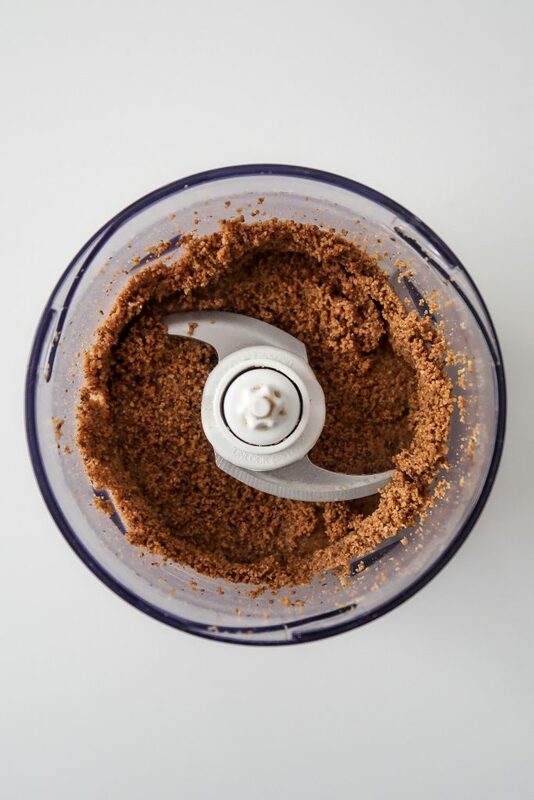 If you want to get fancy, you'll also need some add-ins such as spices, vanilla extract, cocoa powder or dried fruit. 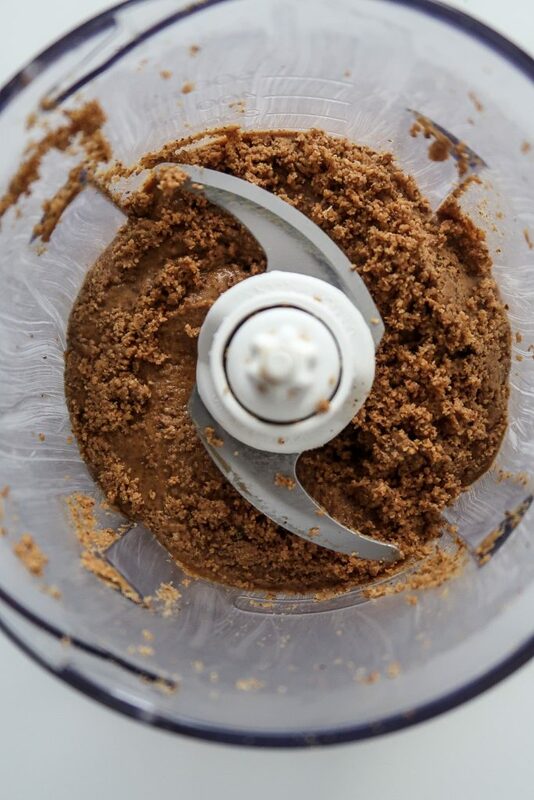 I am using a multi-blade high-speed blender to make my nut butter and I am really happy with it. The power cable is attached to the top part. So you can walk around in your kitchen with the container and don't have to worry about the power cable flying around. The blender is quite small so I can fit in in my tiny kitchen. 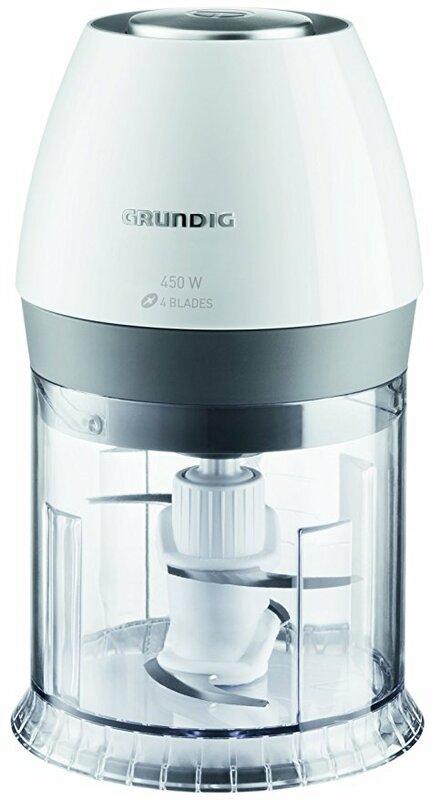 If you're cooking for a big group of people, this blender is probably too small. But if you're cooking for one or two persons and want to make smaller portions it's perfect. 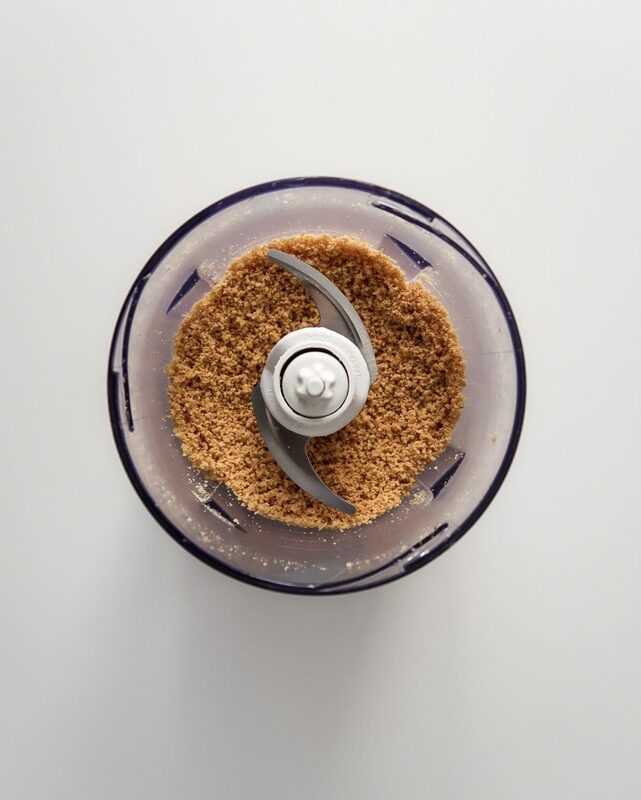 I find that the optimal amount of nuts to use with this blender is ~ 150 g.
What you'll also need to make your own nut butter is patience - and trust in your blender. 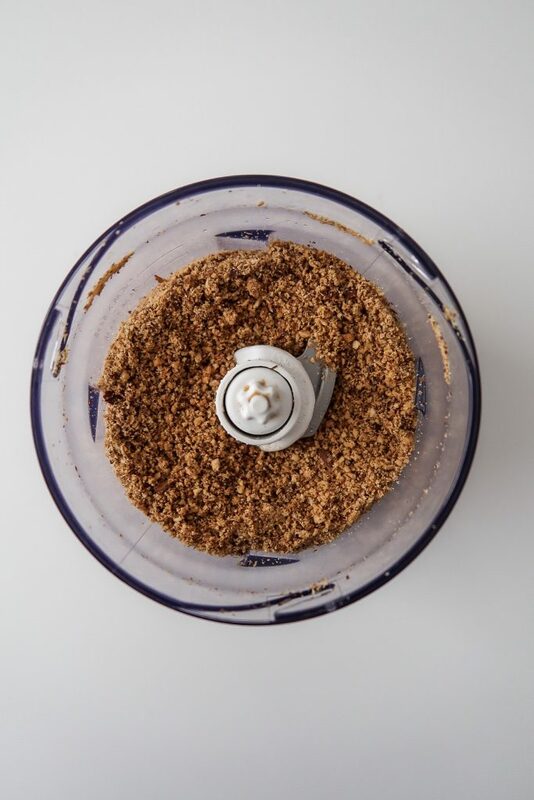 In the beginning it seems as though you're just making crumbs. 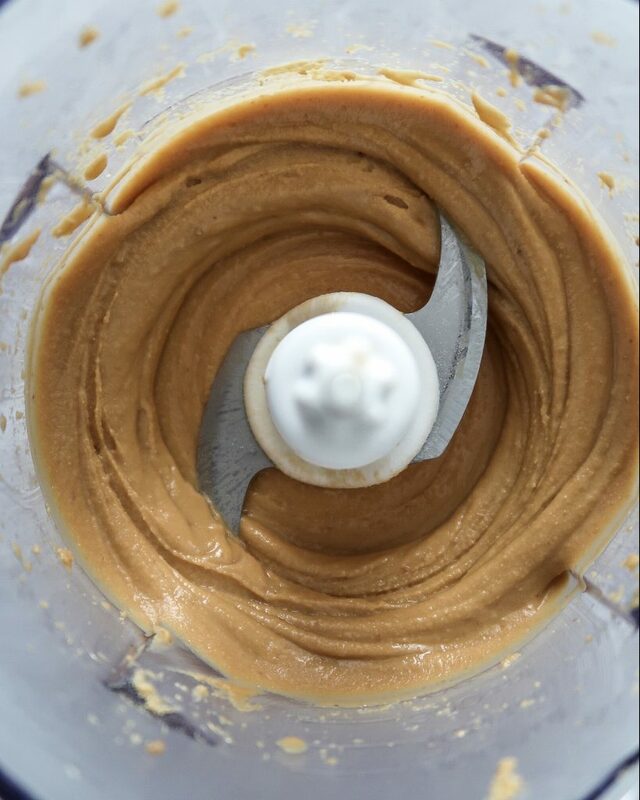 It takes a while until the nuts release their oils to make that smooth, creamy nut butter. So don't give up and keep blending, you'll eventually get there! 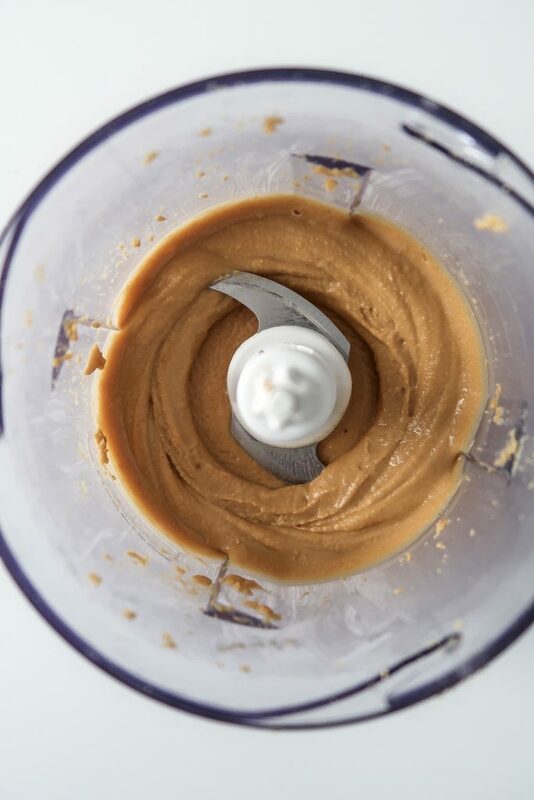 To make salted caramel peanut butter, we will use unsalted peanuts, date puree and sea salt. To really bring out the flavor of the peanuts, I recommend you roast them first in the oven until they become golden brown. 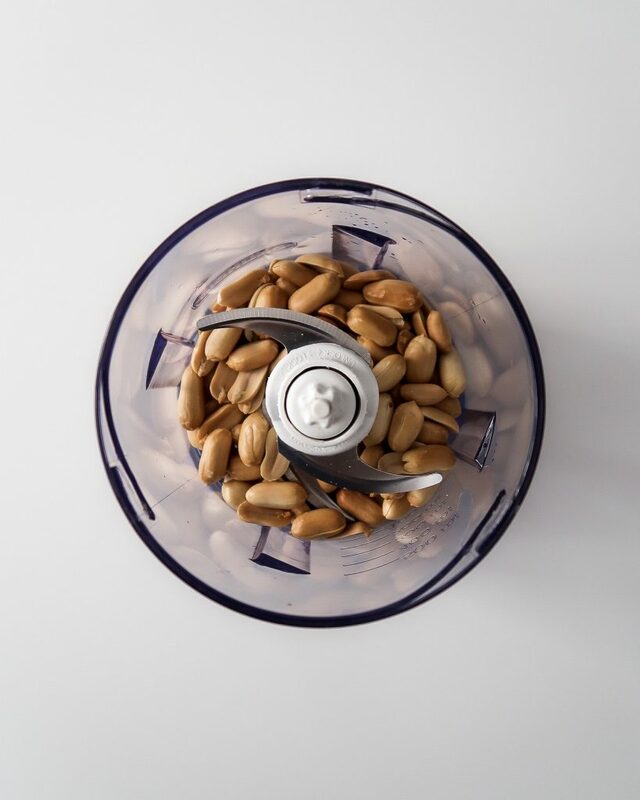 This also makes it easier to blend the peanuts. 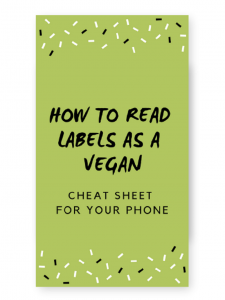 Plus, your peanut butter will have a nice color! In the left picture, I had blended the peanuts for 10 seconds. On the right, you see that already after 30 seconds, a paste began to form. After 60 seconds (left), it already had a buttery consistency. But don't stop here! After 2 minutes, I started to get some creamy peanut butter. After 3 minutes, I had reached my desired consistency so I decided to add the date puree and sea salt. 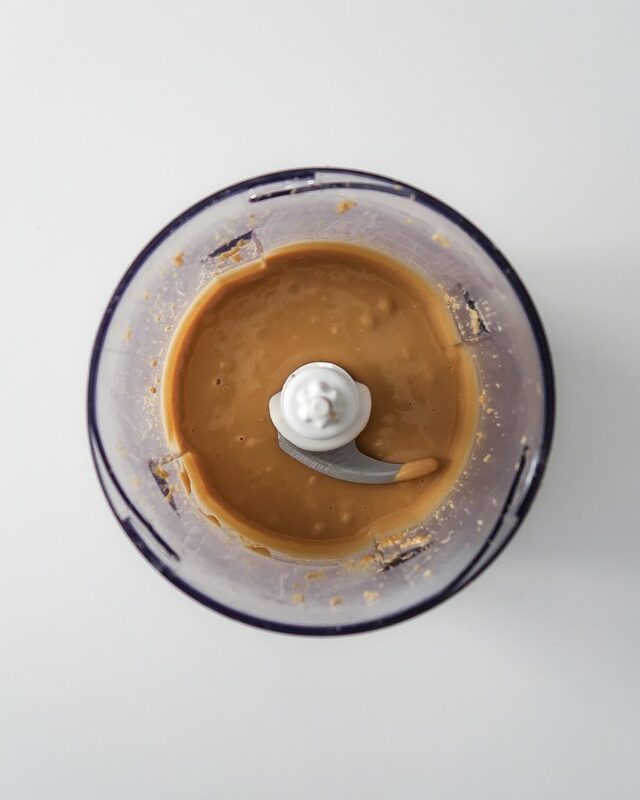 You know you have the right consistency when the peanut butter is very runny and moves when you tilt the container. 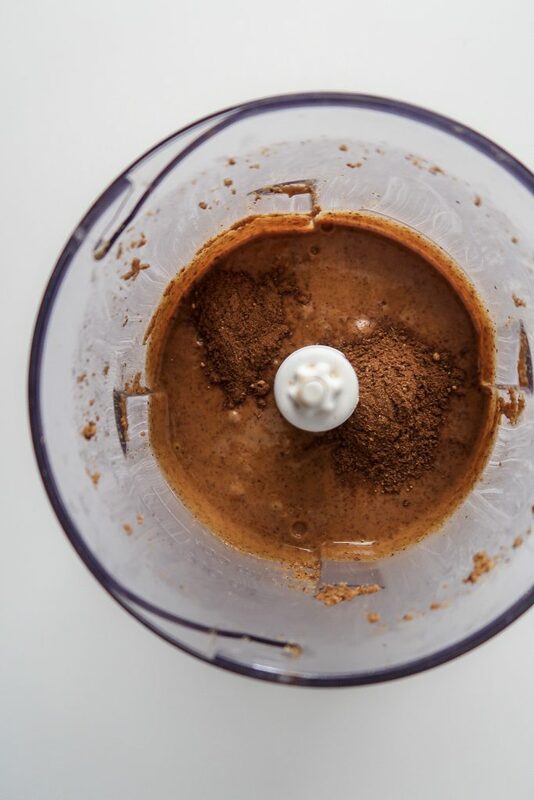 Here you see the result after 5 minutes of blending. Because I added the date puree, the end consistency was a bit thicker but still very smooth. If you’re using unroasted peanuts, pop them in the oven for ~ 15 minutes at 160°C/320°F. Pay close attention so they don’t burn. Once they are golden-brown, remove from the oven and let cool slightly. 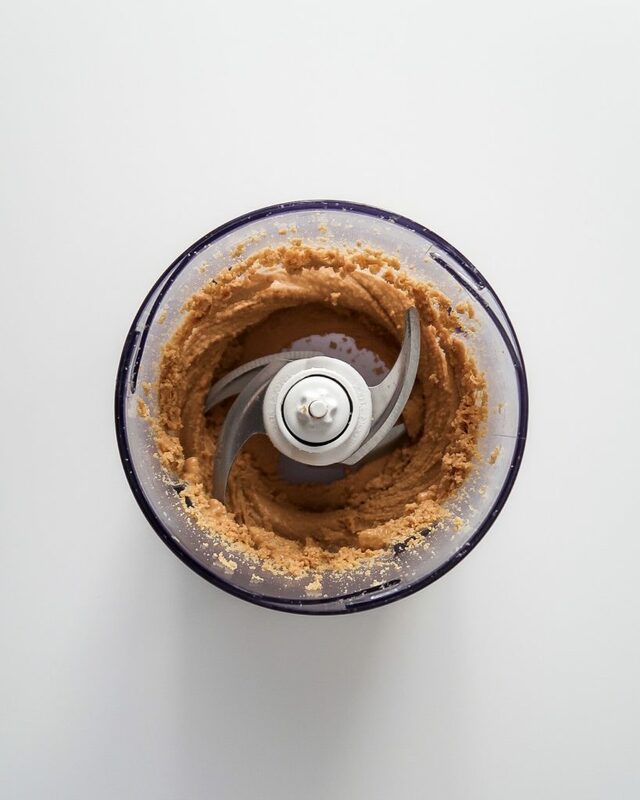 Add the peanuts to a food processor or blender and blend for ~ 3 minutes until the peanut butter is smooth. It should be runny when you tilt it. Add the date caramel and sea salt and blend for another ~ 2 minutes. 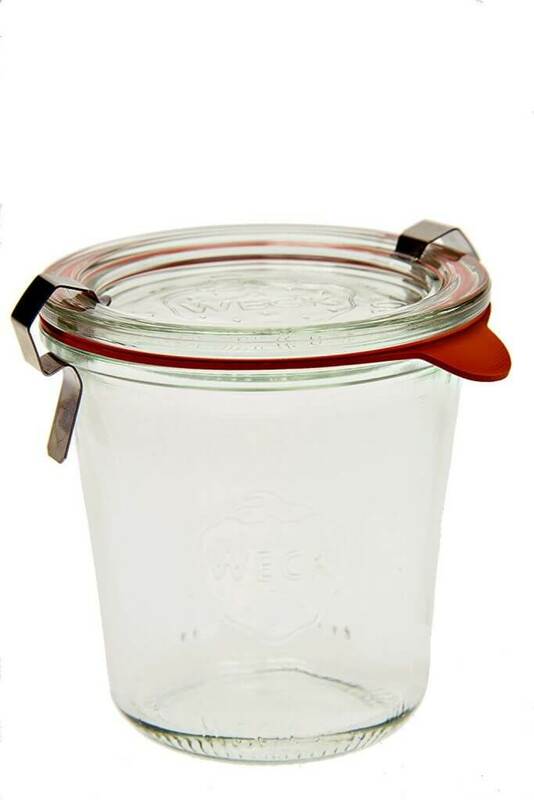 Transfer to a jar and store in a cool, dry place. 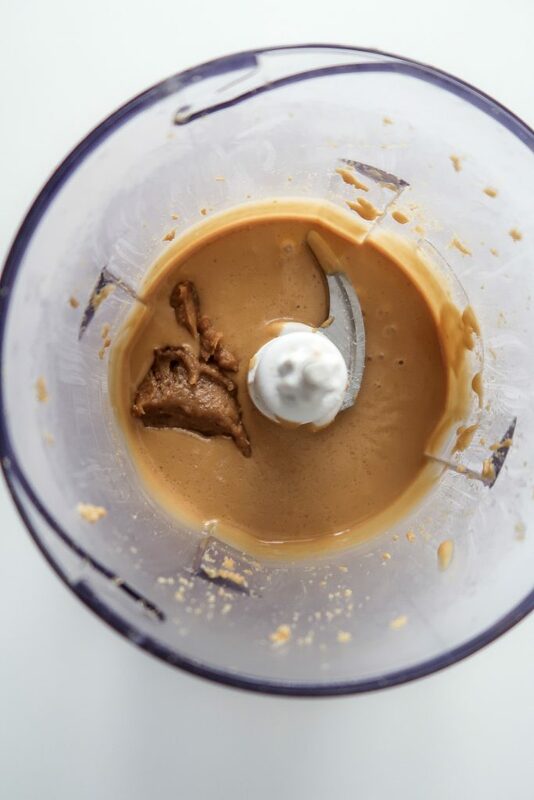 You can also make crunchy salted caramel peanut butter. 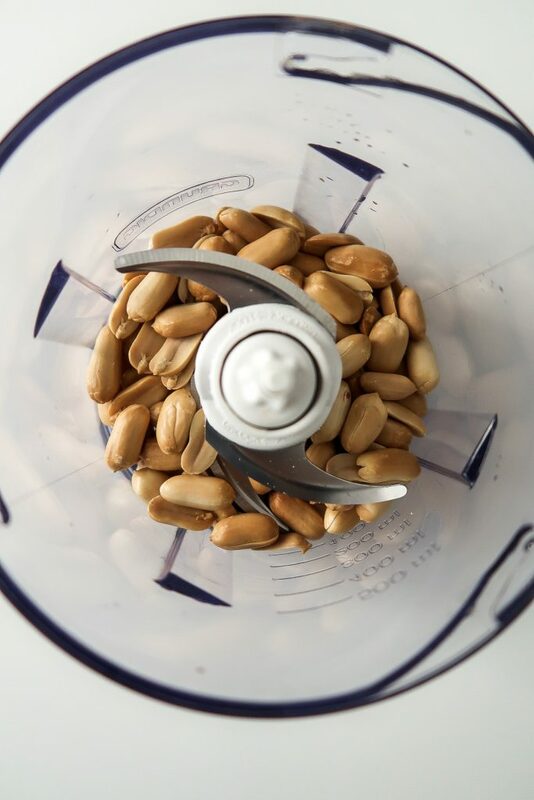 In step 2, start with pulsing the peanuts a few times. 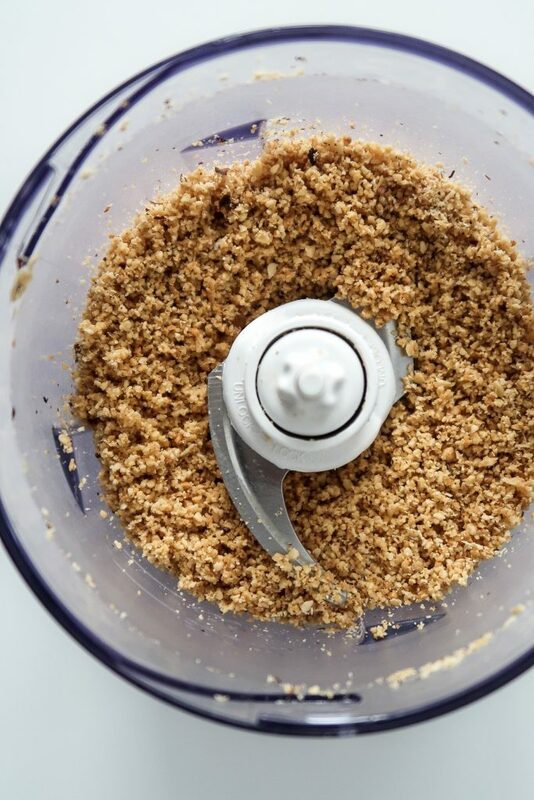 Then, remove a tablespoon or two of peanut chunks and continue with the recipe. Add the peanut chunks back in just when the peanut butter is done and pulse a few more times. 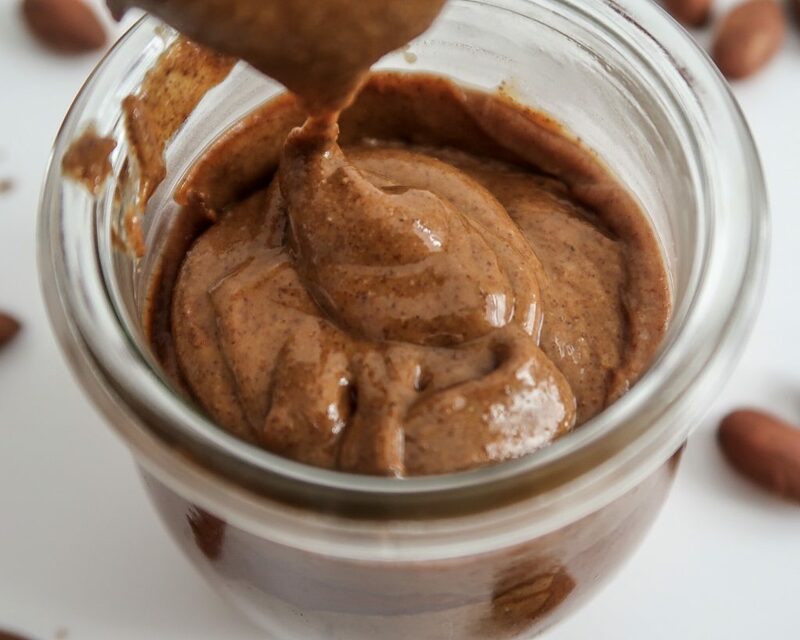 When you make hazelnut butter, it is important to remove the skin of the hazelnuts as it can become quite bitter. 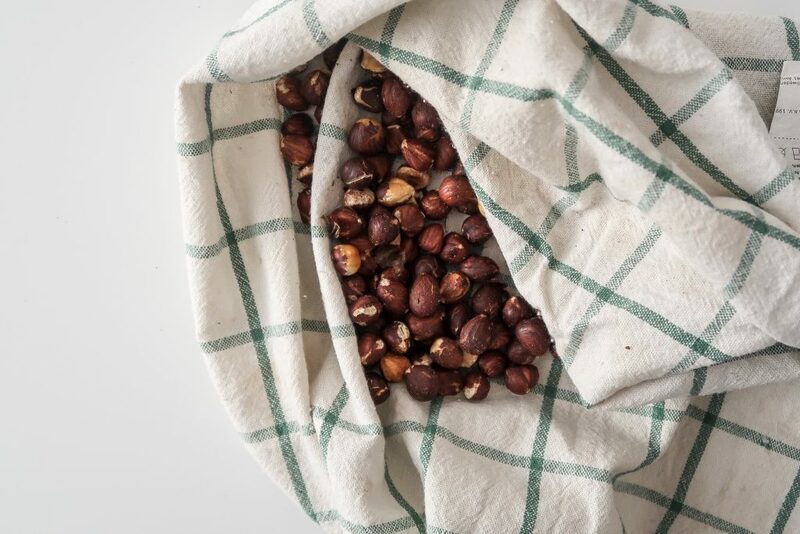 The simplest way is to roast your hazelnuts in the oven and then (through applying pressure with a tea towel) the skins should come off easily. For this chocolate version, I added cocoa powder and some date caramel for sweetness. 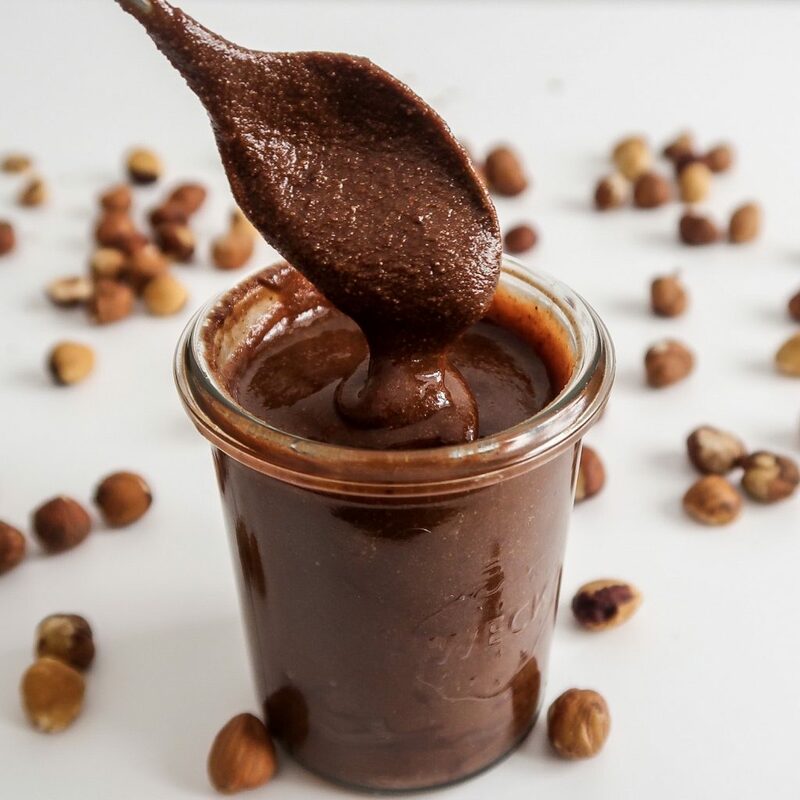 You can really taste the chocolate and the hazelnuts and it is not too sugary, which makes this recipe one of my favorites. You don't have to remove all of the skin. Most of it will come of easily after roasting but it is totally fine if there are some dark spots. After 10 seconds (left), the nuts were very crumbly. After 30 seconds (right) they began to form a thick paste. After blending the nuts for 60 seconds (left), the nuts came together into a thick paste but the oil wasn't released yet. After two minutes (right), it was a lot more runny and smooth. 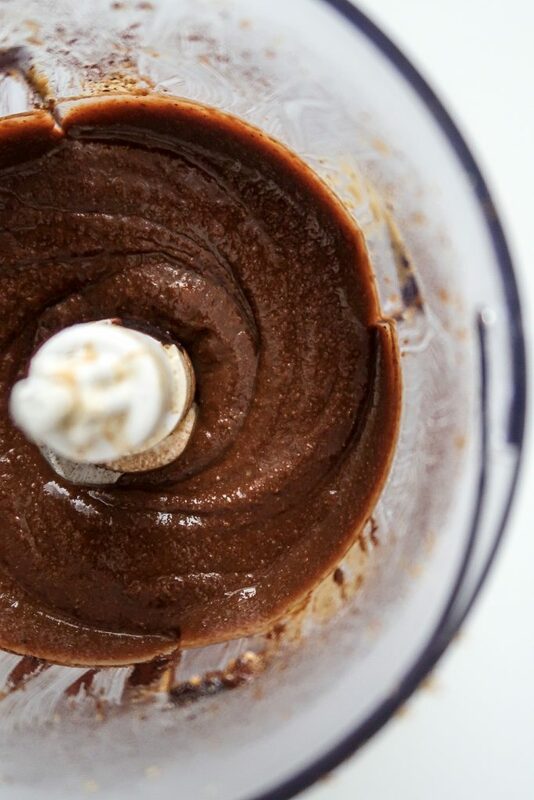 After 3 minutes, I added the date caramel and cocoa powder to the hazelnut butter. 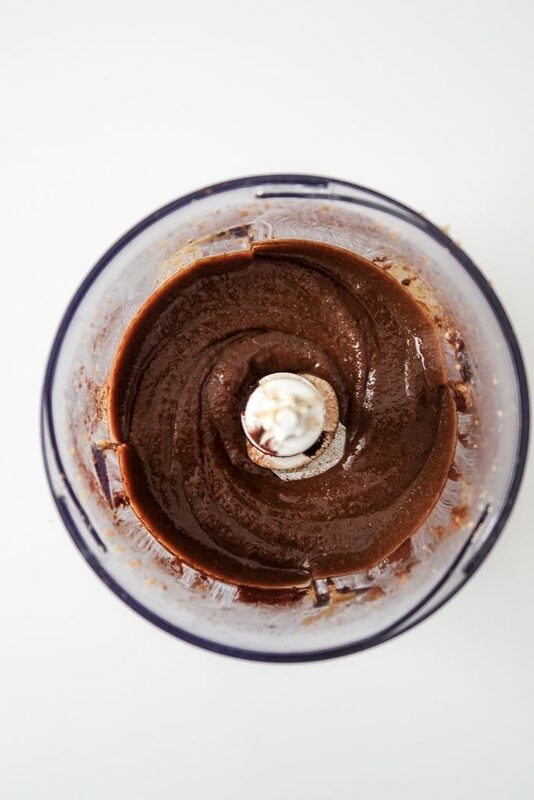 I blended for another 2 minutes and got this beautiful, rich and creamy hazelnut chocolate butter. Roast the hazelnuts in the oven for ~ 15 minutes at 160°C/320°F. Pay close attention as they can burn easily. Once they are browned (not burnt!) on the outside, remove from the oven and let cool slightly. 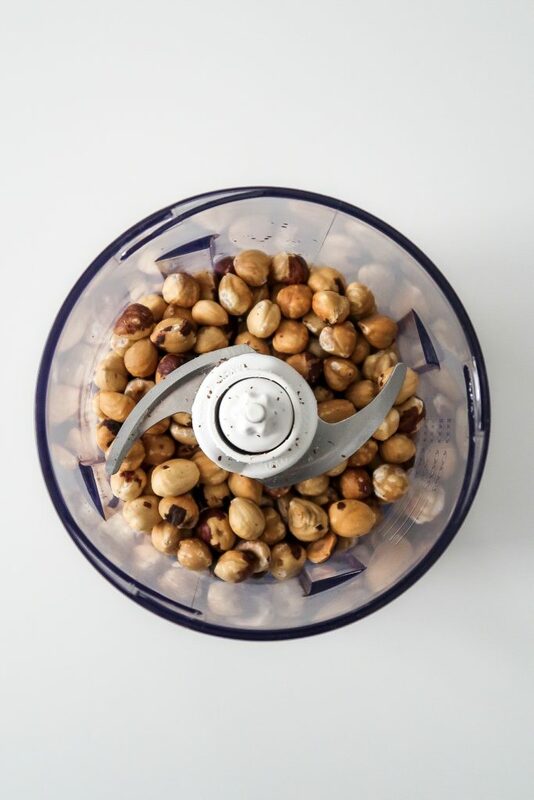 Skip this step if you’re using peeled hazelnuts. If not, to remove the skin, transfer the hazelnuts onto a clean tea towel. Fold the tea towel over and apply pressure in a circular motion to remove the skins. 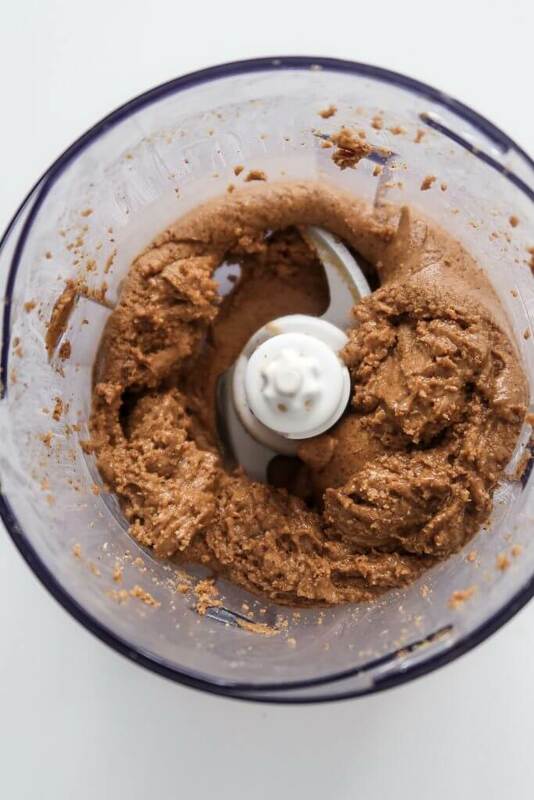 Add the hazelnuts to a food processor or blender and blend for ~ 3 minutes until the hazelnut butter is smooth and runny. Add the date caramel and cocoa powder and blend for another ~ 2 minutes. 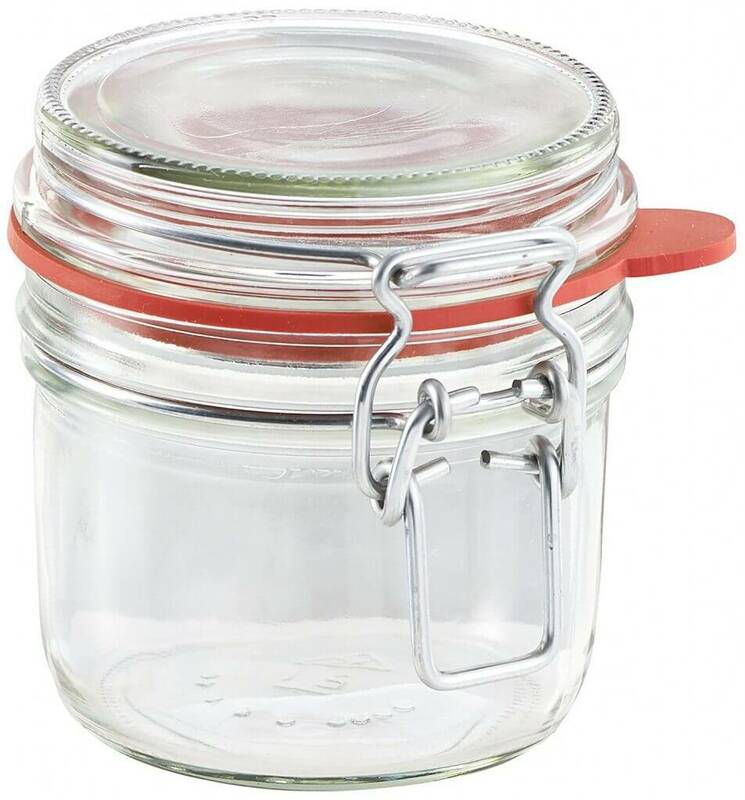 Transfer to a jar and store in a cool, dry place. 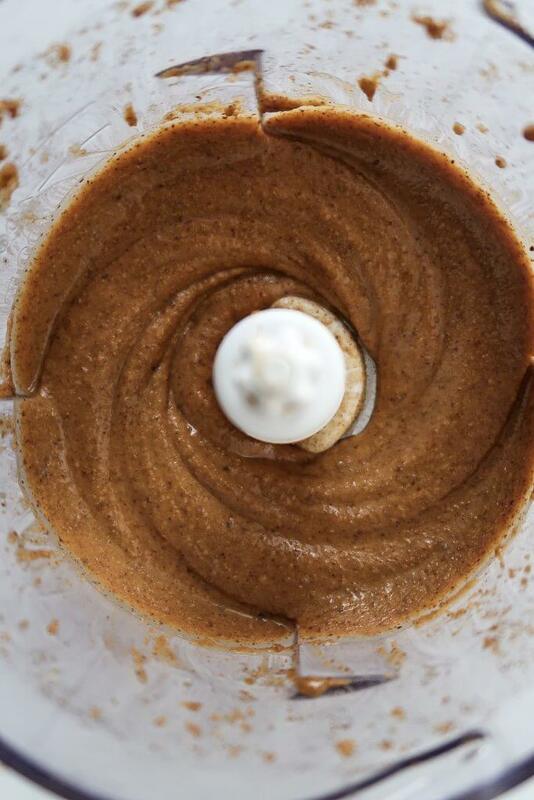 As the skin of the hazelnuts can be quite bitter, we want to remove them prior to blending. 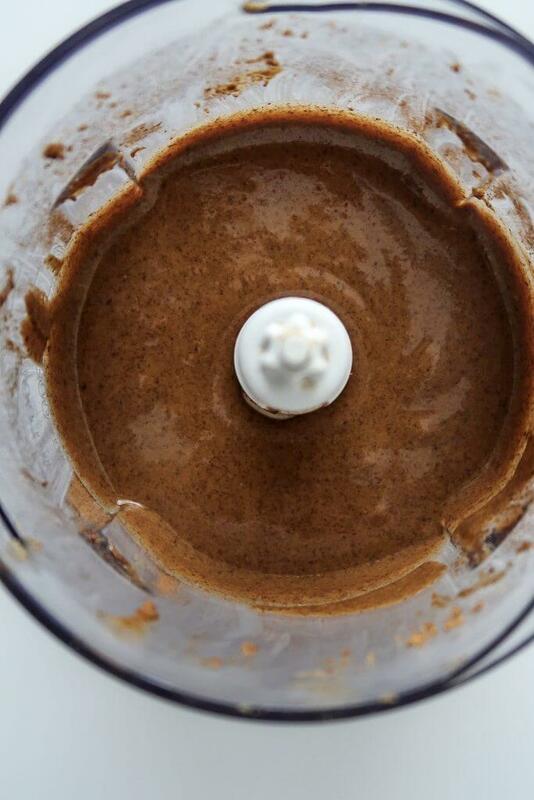 This also makes the nut butter smoother. However, you don’t need to be super precise here. Just try and remove as much as possible (see pictures for reference). 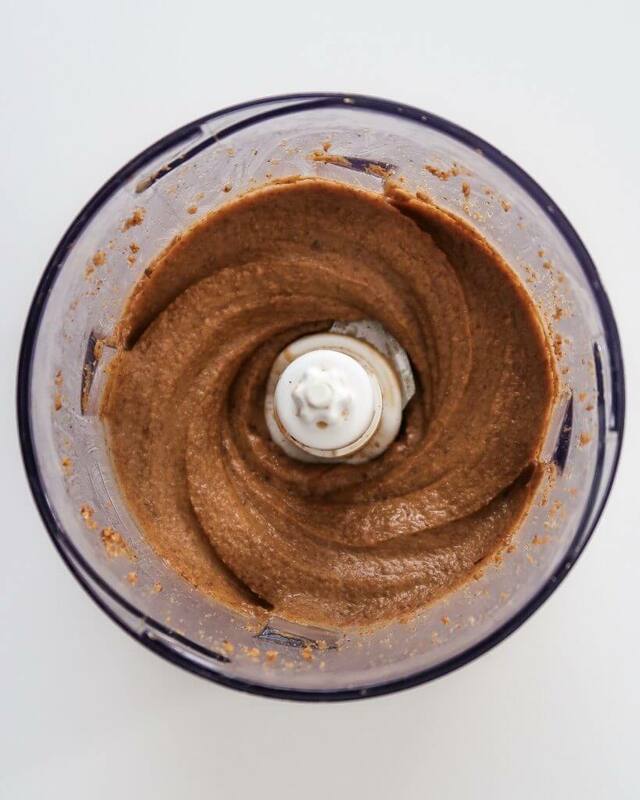 This almond speculoos butter is full of flavors and perfect for those late autumn and early winter days. 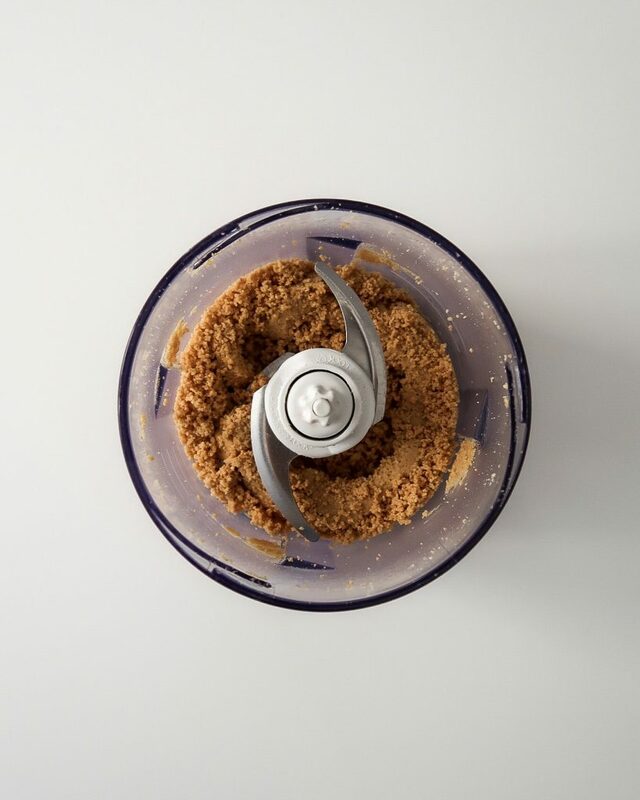 All we need is roasted almonds and a speculoos spice mix. You can get it ready-made in the supermarket but I decided to make my own with what I had in my kitchen. On the right, I had blended the almonds for 10 seconds. After 30 seconds (left), it looked a little bit like brown sugar. 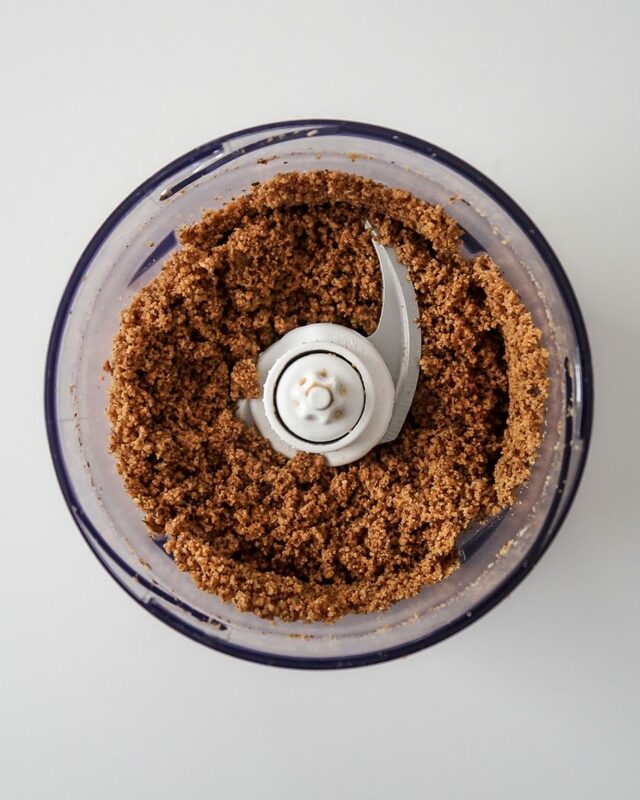 After blending for one minute, it was still crumbly but starting to form a thick paste. After 2 minutes (left), you can see some drops of oil but we're still not quite there yet. 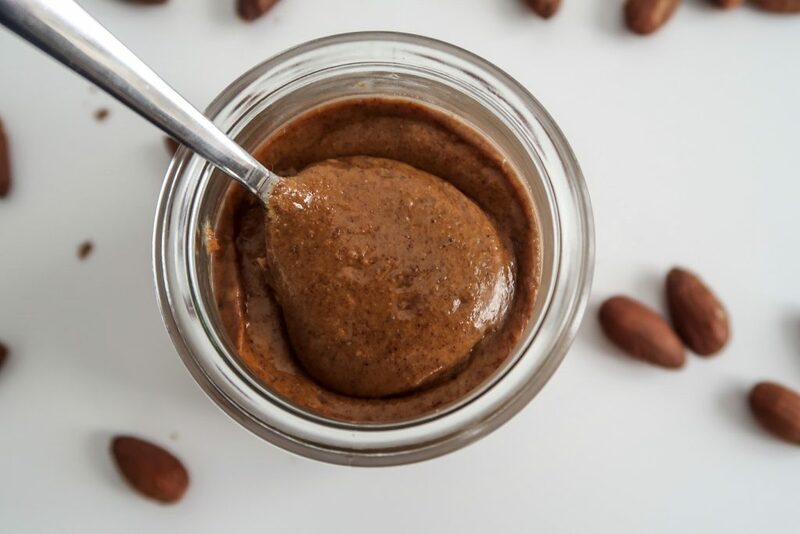 Making this almond butter took a little bit longer than the peanut and hazelnut butters. That might be because almonds take a bit longer or because I used more nuts in the blender. On the right, I had blended it for 3 minutes. After 4 minutes, I added the spices. 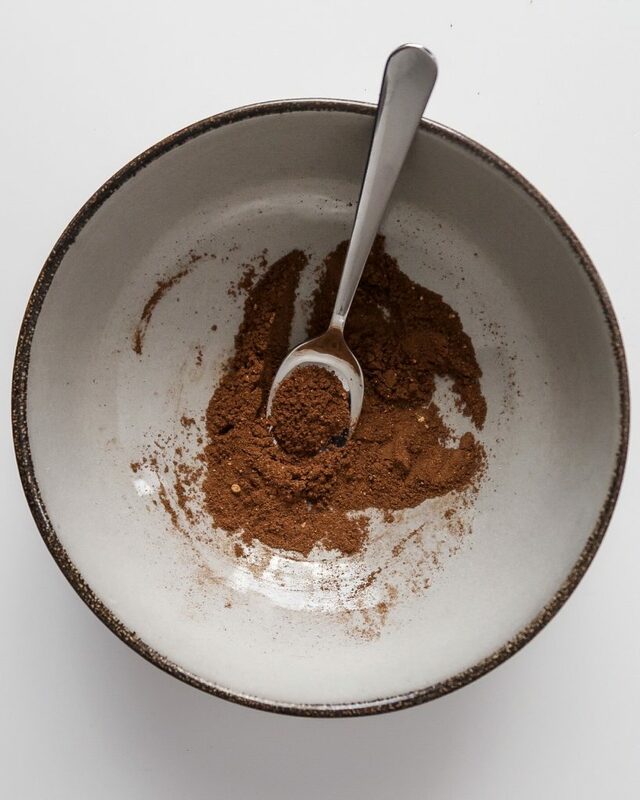 The speculoos spice mix is made with cinnamon, ground nutmeg, ground cloves, ground aniseed, ground ginger and ground coriander seeds. Then I blended for another 2 minutes. Roast the almonds in the oven for ~ 15 minutes at 160°C/320°F. Pay close attention so they don’t burn. Remove and let cool slightly. 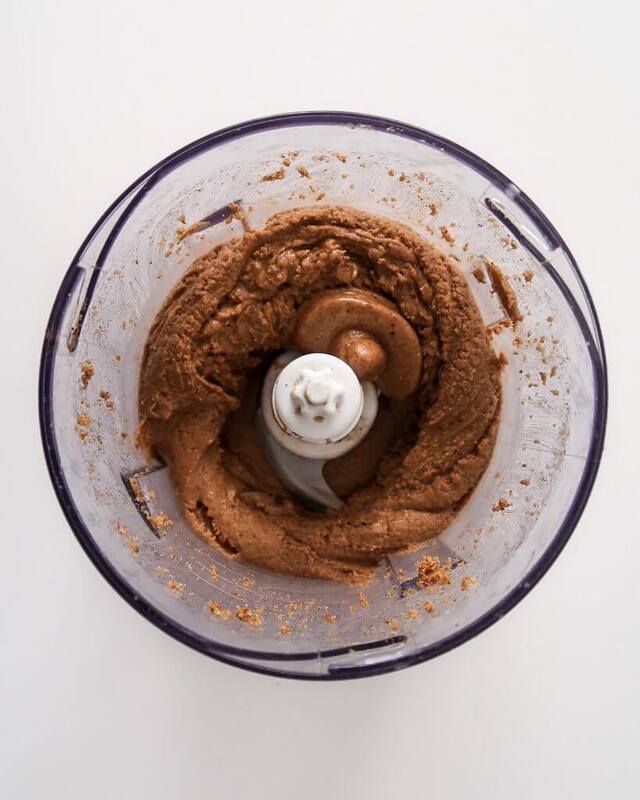 Transfer the almonds to a blender or food processor and blend for ~ 4 minutes until you have a smooth and runny almond butter. You may need to scrape down the sides once in a while. Add the date caramel and spices and then blend for another ~ 2 minutes. 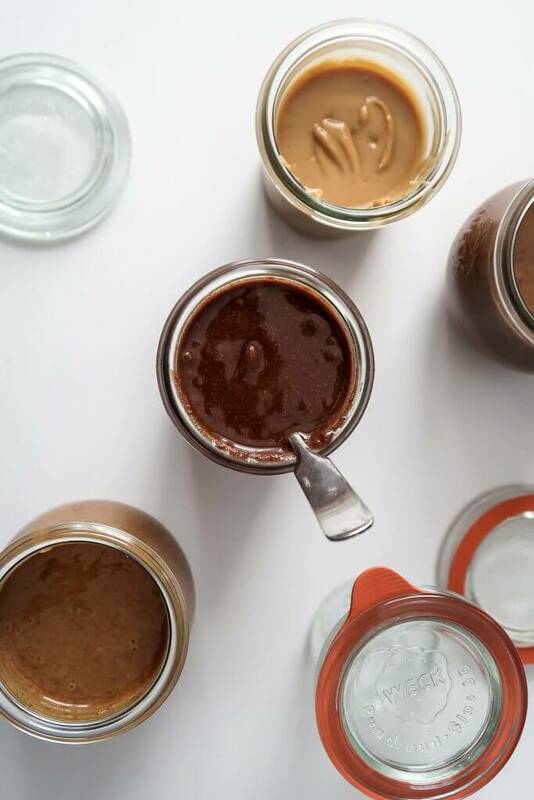 Transfer the nut butter to a jar and store in a cool, dry place. 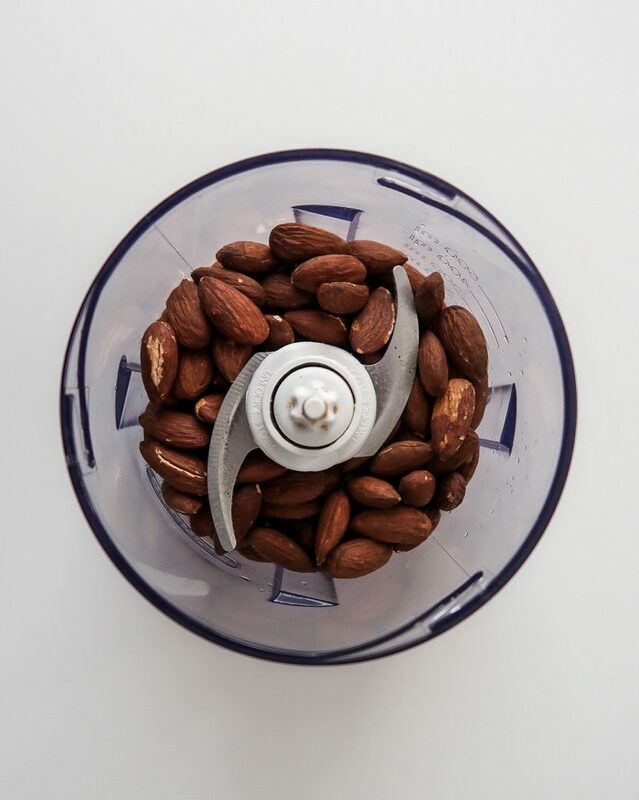 If you prefer peeled almonds (or white almond butter), you need to soak the almonds first. Soak them in hot water for ~ 10 minutes, then remove the water and let cool slightly. You should be able to remove the skin by pinching slightly with your fingers. Then, continue with step 1. 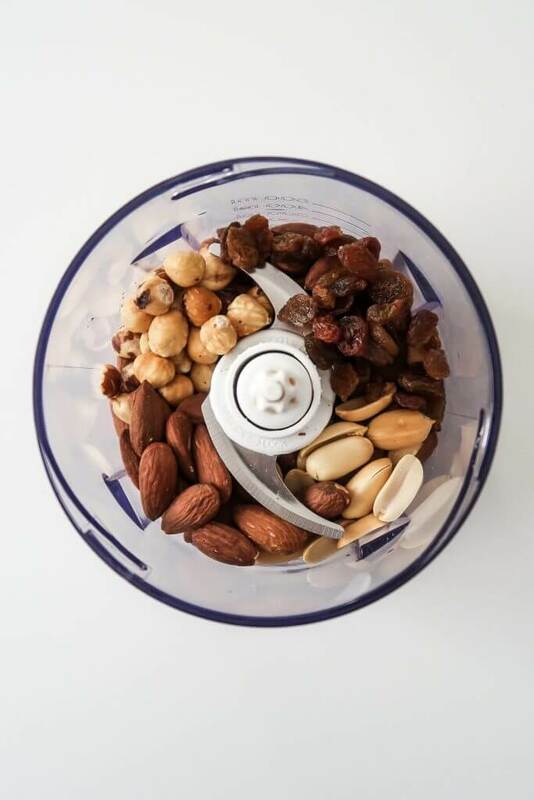 This trail mix nut butter is a great way to use up any nuts, seeds and dried fruit you have left over. I decided to mix the hazelnuts, peanuts and almonds from the previous three recipes and added some raisins for sweetness. On the right, you can see what my trail mix nut butter looked like after 30 seconds of blending. 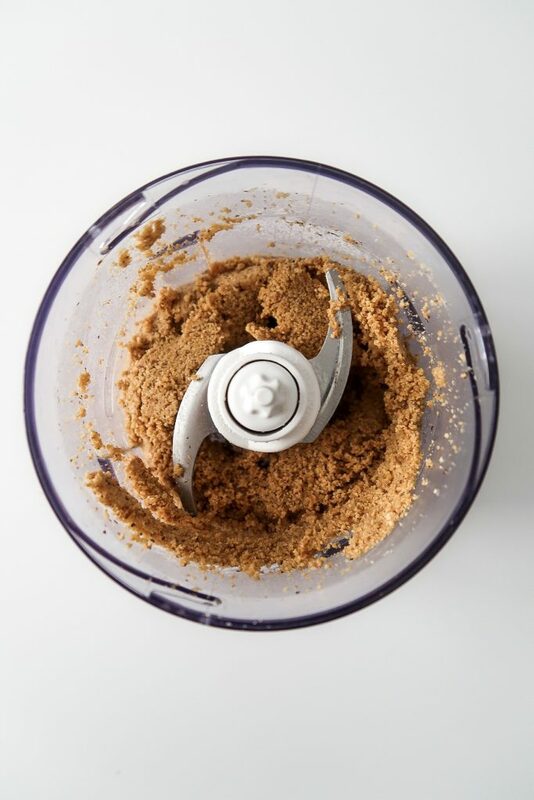 You might have to scrape down the sides once in a while if the nuts stick to the sides of your blender. 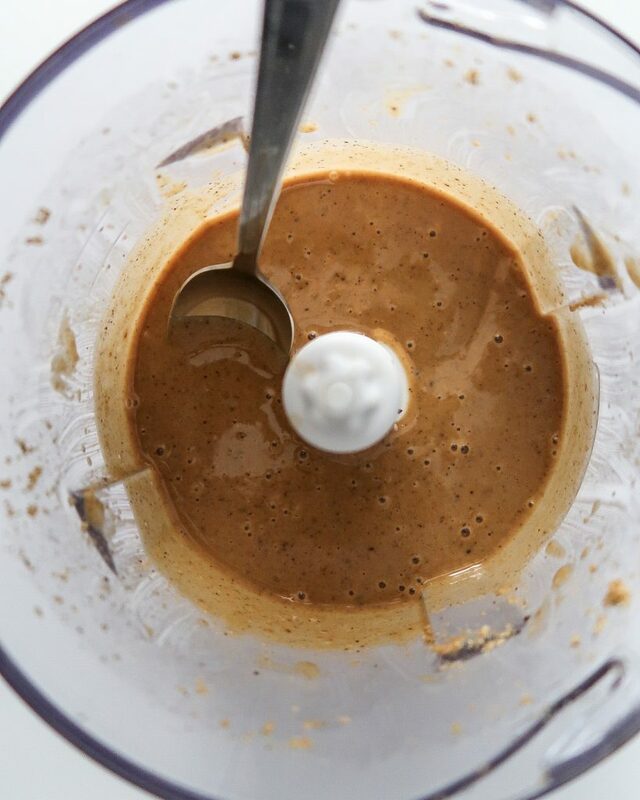 Out of the four recipes, this nut butter took the longest to make with 9 minutes. After 2 minutes, a very thick paste, almost like a gigantic energy ball had formed. After 4 minutes, you could start to see the oil. I could've probably stopped after 7 minutes (below, left) but wanted to make it a little smoother (below, right). Roast the almonds, hazelnuts and peanuts in the oven for ~ 15 minutes at 160°C/320°F. Make sure they don’t burn. Once they are browned, remove from the oven and let cool slightly. 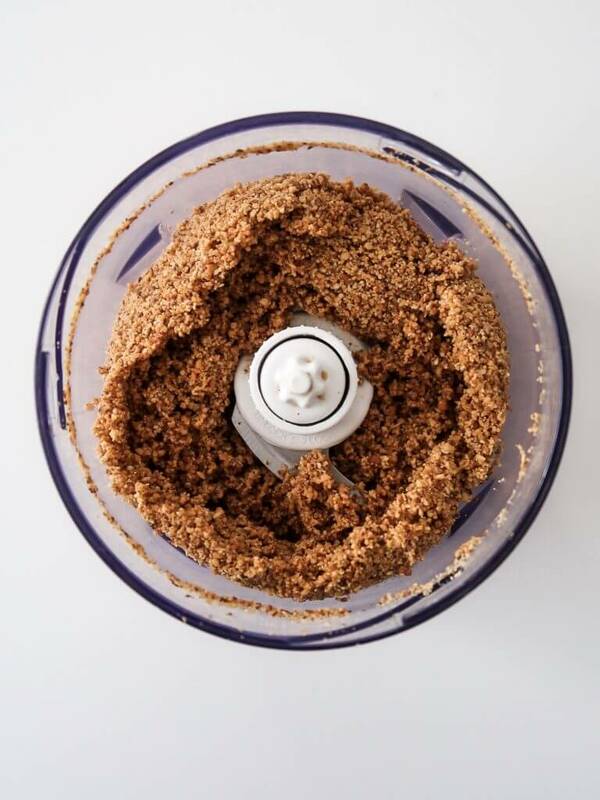 Remove the hazelnut skins by gently, with your hands, applying pressure in a circular motion. 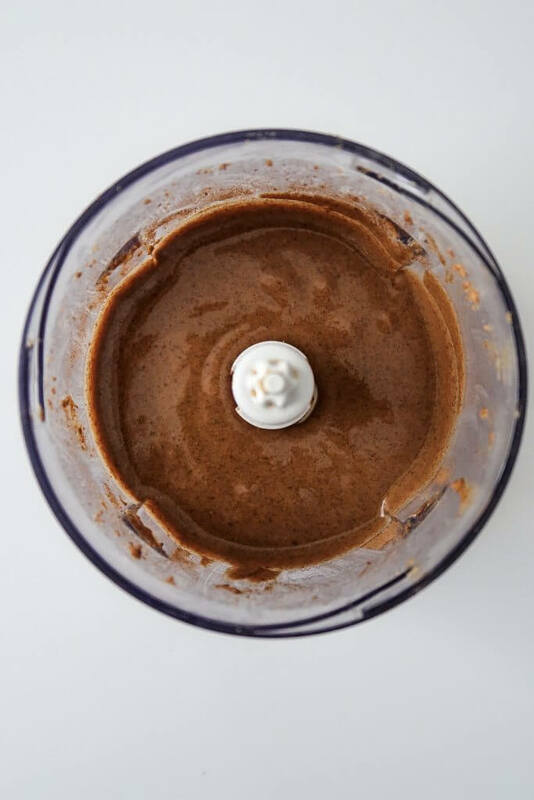 Add all the ingredients in a food processor or blender and blend for 5-10 minutes until the nut butter is smooth and runny. You may need to scrape down the sides occasionally. 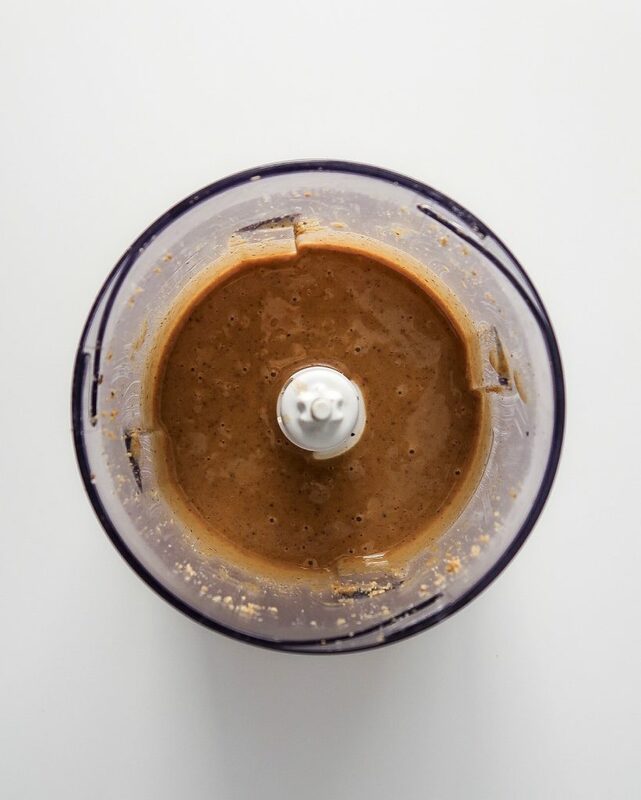 Transfer the nut butter to a jar and store in a cool, dry place. 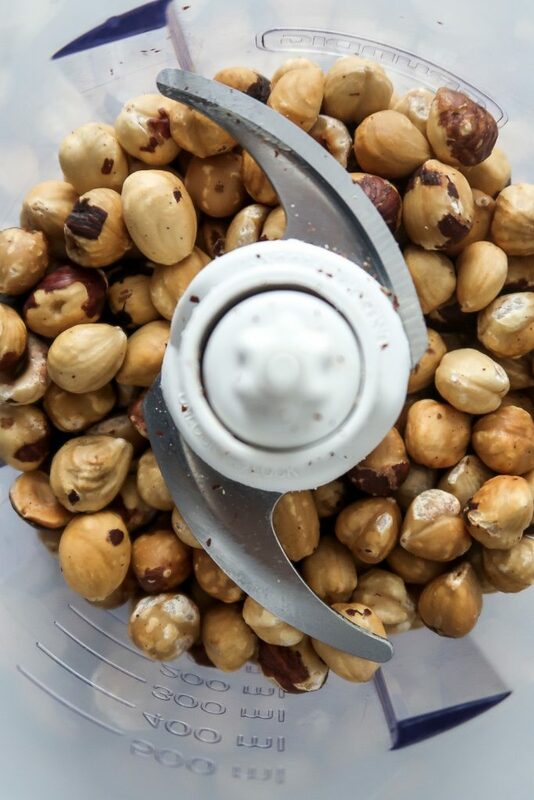 This trail mix nut butter is your chance to go wild! 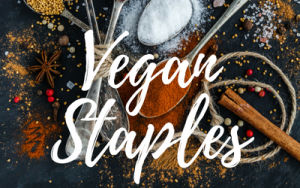 You can add cranberries, walnuts, macadamia nuts, brazil nuts, pecans, cashews, dried apricots, sunflower seeds – everything you’d find in a trail mix!